…but finally after all these weeks, I’ve managed to arrange the date with my old friend Matheo, who is playing The Empire. We both were starting from 5th edition of WHFB, which is sometimes called right now – Herohammer (overpowered characters with even more overpowered magical items were able to annihilate all armies in close combat – there were times…) and we have big sentiment to the game. The battle of Rhoden in Ostland Province of The Empire was one of such battles and it is forever remembered in the annals of The Empire of men. Ikit Claw, Master Engineer, Emissary of Clan Skryre has discovered large deposit of warptone near the small settlement man-things called Rhoden. Such a opportunity! He could power the great tunnel drilling machine for months with the warpstone buried under the ruins of Rhoden. Stupid man-things didn’t even know! Ikit was clever! He gathered Clan Scryre finest armoury and hired some common butuseful rats from other clans to support his cause. He also convinced the greatest Assassin ever lived to help him to achieve his goal. Deathmaster Snikch of Clan Eshin agreed to participate in the scheme. The plan was to kill all weak man-things from Rhoden, capture the most resilient ones to work in warpstone mines, and when the area is secured – drill tunnels under the ruins and start mining the precious warpstone. Perfect plan with no flaw! Unfortunately man-thing, so called ‘Count’ Mathias von Stashek had very good reconnaissance. He managed somehow to discover Ikit’s secret plot and he has organized defence of Rhoden. Of course they will be no match for the power of Clan Skryre! Even more slaves to the mines! Even more glory for Ikit! We have decided to play simple scenario which going to last 6 turns, and whoever gets more victory points win the battle and gets control of Rhoden and the ruins. You may notice some part of Matheo’s models are unpainted. Usually I don’t like to play against unpainted army, but we know each other for so long time and I really was looking forward to play with Matheo for some time. So, you know, some rules are just to be broken:). The ruins of Rhoden were in the middle of the battlefield. 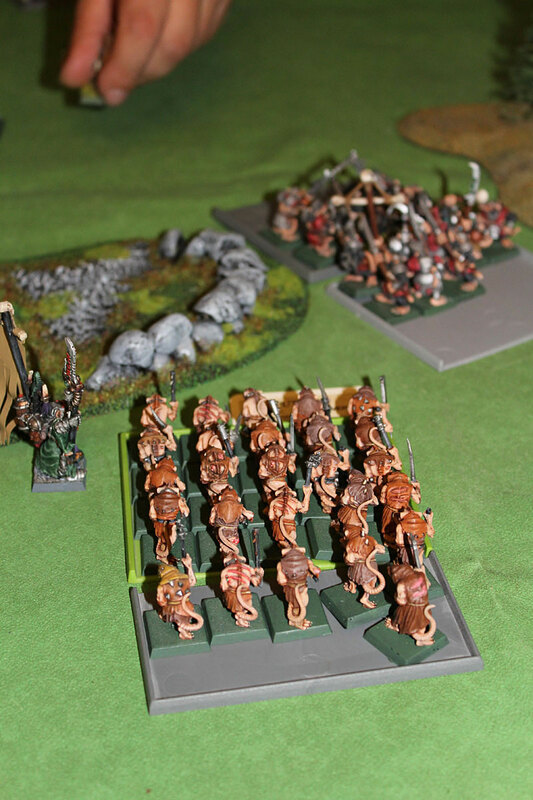 Skaven deployed their army in the south of the ruins and Empire north. The battlefield. Skaven forces will deploy south (down) and Empire north (up). Ikit Claw begin the battle along with Battle Standard Bearer in the regiment of Clanrats. Deathmaster Snikch sneaked around the hill on the west, close to the enemy line. 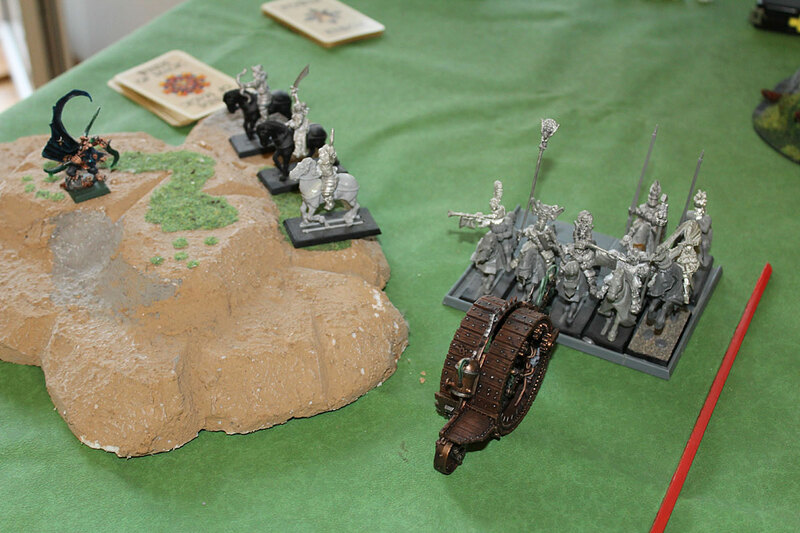 Skaven deployment: from the west: Jezzails, Doomwheel, Clanrats ( with Ikit Claw and Battle Standard Bearer), second Doomwheel, Slaves and and very far east (up on the photo) Stormvermin. Deathmaster Snikch is sneaking to the enemy lines on the west. Count Mathias rode his warhorse along with Battle Banner Bearer and Knights of The Blazing Sun. 2 wizards have joined the unit of Swordsmen. Empire deployment: from the west (down on the photo) Kislev Horse Archers, Knights of The Blazing Sun, Cannon, Helbaster Volleygun, Swordsmen, Flagellants and Crossbowmen. Ikit was not intending to play some calculated game here. He ordered to advance to all of Skaven units. Doomwheels rolled at full power, Clanrats on the west, Slaves in the middle and Stormvermin on the east – they all marched forward. Doomwheels’ Engineers decided not to release any lightings this time. 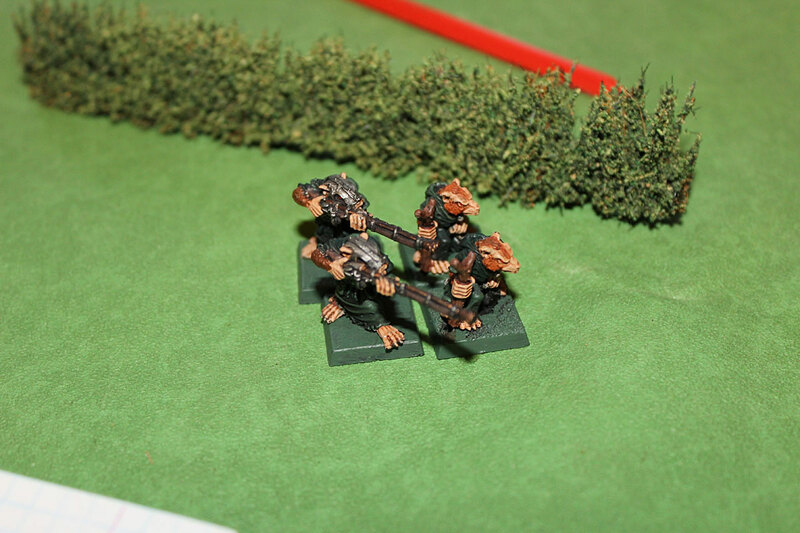 Rolling Doom, Master Assassin Snikch and Clanrats, they all advancing the enemy. 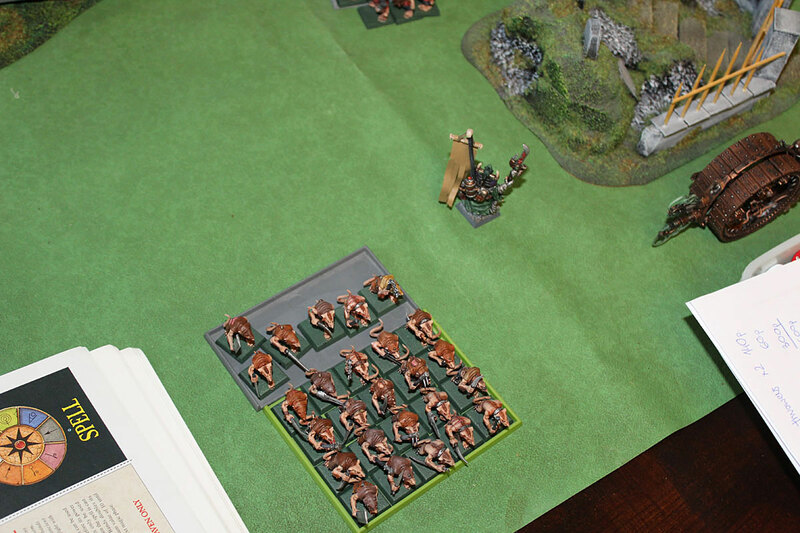 There were high possibility the charges will hit Skaven. 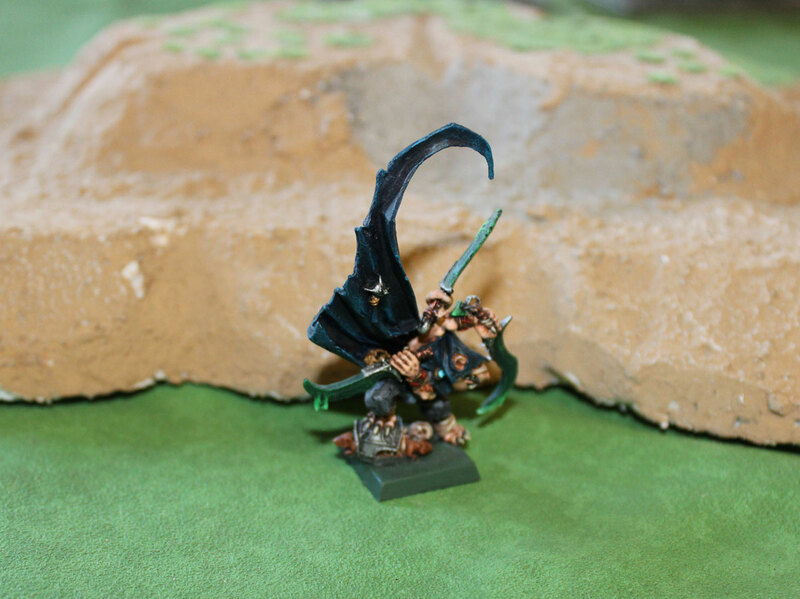 Ikit Claw was different than other Skaven Lords – he valued Skaven life, or maybe in other words – he valued warp tokens that he had to spend to hire this army. Lightings will strike next time – when Ikit will be sure they will strike the enemy. Count von Stashek was very eager to neutralize chaos threat. He wanted get rid of any vermin off his land as soon as possible. Knights on the west and Swordsmen and Flagellants on the east marched on to incoming Skaven. Sowrdsmen in front of Doomwheel. 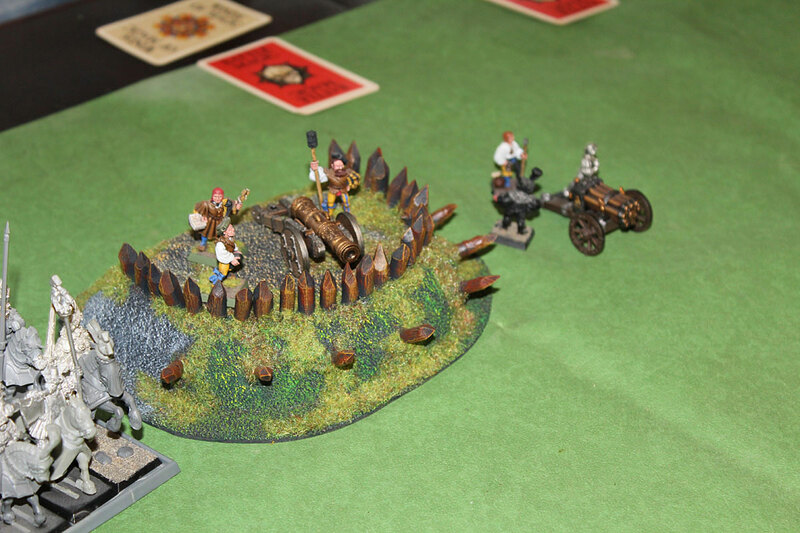 Great Cannon hit Doomwheel and Helblaster Volleygun misfired. 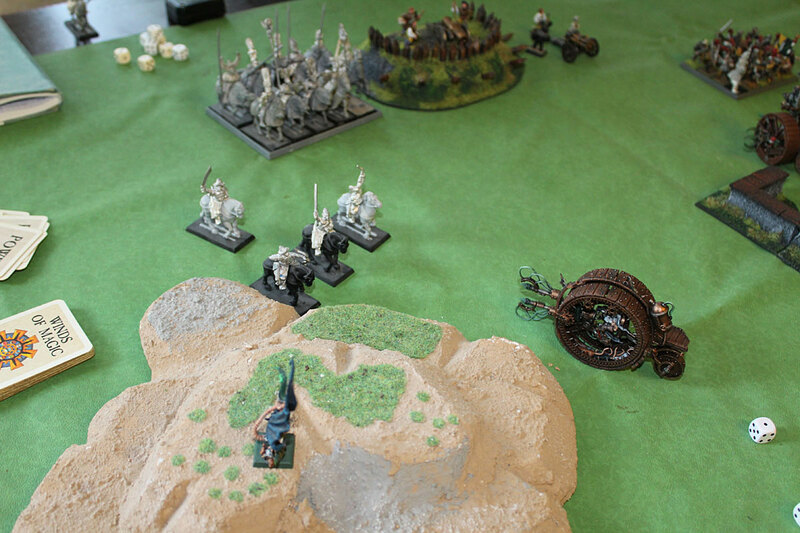 On the east side Crossbowmen shot Stormvermin, but they failed to kill even one Skaven. 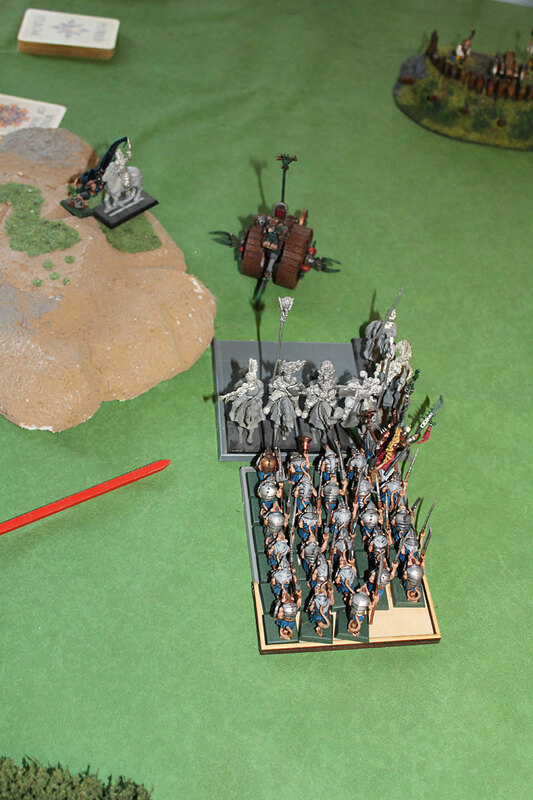 One of Empire’s Wizards tried to cast Move Unit spell on the Swordsmen. Ikit could not allowed to teleport these man-things into close combat with any of his unit. No way, on this stage of the battle, so he decided to dispel the spell. At this point Ikit decided to stop his regiments from marching closer to the enemy line. Helblaster Volleygun was out, so the threat from this destructive machine was neutralised. Ikit ordered Clanrats, Slaves and Stormvermin to hold their ground. Only Doomwheeels moved forward. 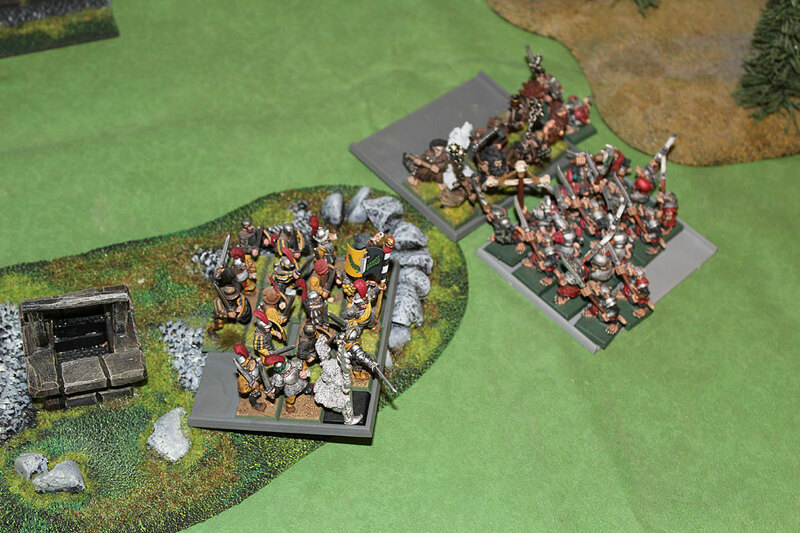 Snikch was not about to listen any orders from Clan Skryre and he moved out his hideout behind the hill and he closed to the Kislev Archers. This time Doomwheels released the electricity charges! First Doomwheel’s lightings struck the Kislevites killing one, but the second Doomhweel’s power generator misfired, causing control mechanism malfunction. Engineer lost control of the steer and all the wheel! 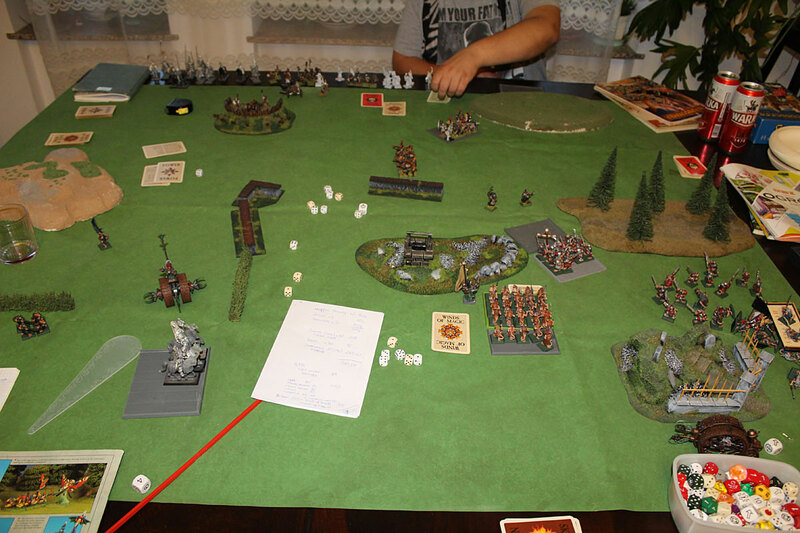 Meanwhile Deathmaster Snikch threw his assassin stars at the Kislev horsemen unit, but he failed to kill. 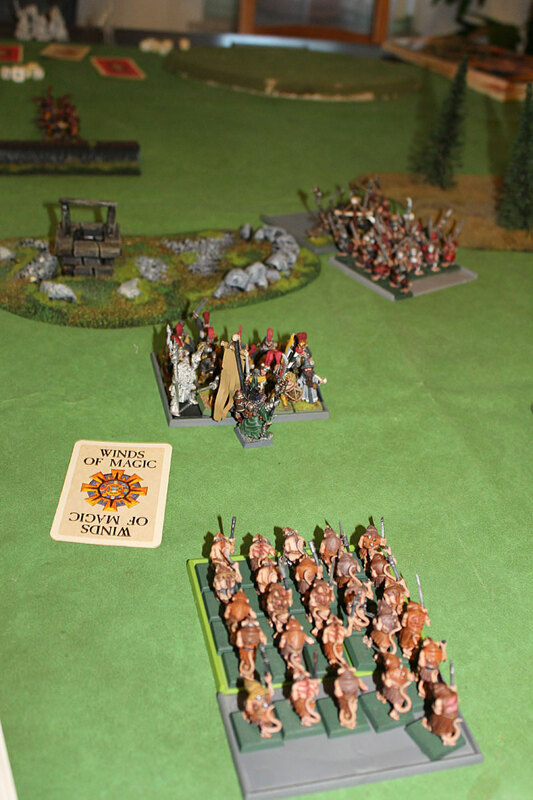 Jezzails (as usual) missed The Knights, but on the right flank – Warpfire Thrower fired and burn 6 Flagellants. The smell of flesh and warp fire was furling above the battlefield. Clan Skryre inventions are the best! 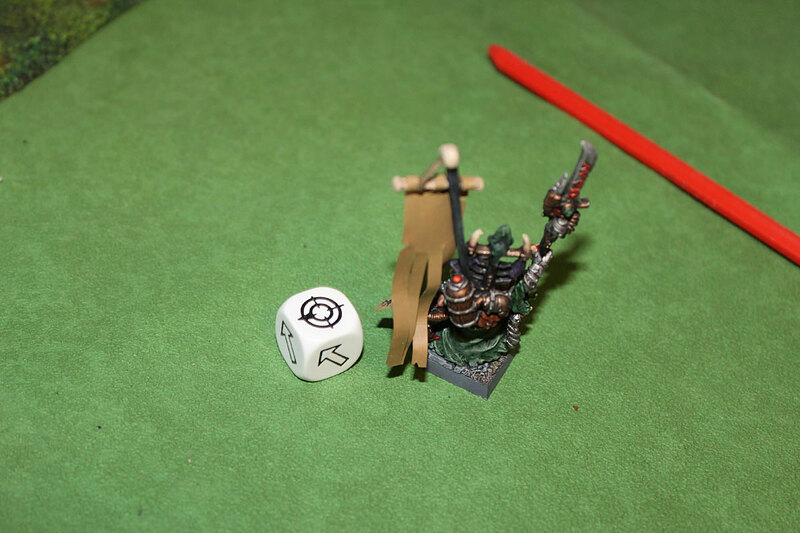 So, Ikit Claw decided to fire up his own personal piece of Skaven technology – Storm Daemon. He pointed The Knight unit with his halberd and released lighting killed instantly three of the riders. There were lot of electricity charges in the air this day. Unfortunately Storm Daemon power generator went flat. The energy of the halberd has exhausted. It was the moment The Empire attacked. 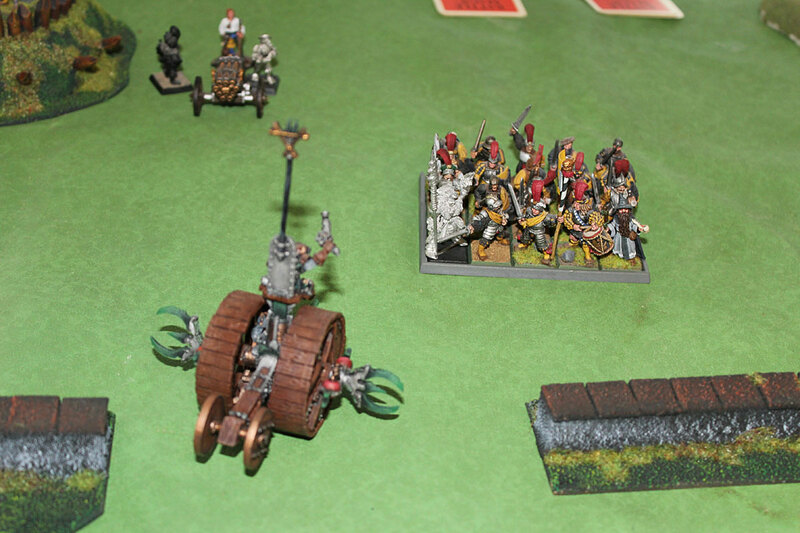 Knights attacked damaged Doomwheel, Swordsmen charged second Doomwheel and Flagellants advanced toward Stormvermin. Meanwhile Kislevites missed to hit Jezzails and Crossbowmen didn’t manage to kill even one Stormvermin with their bolts (again). 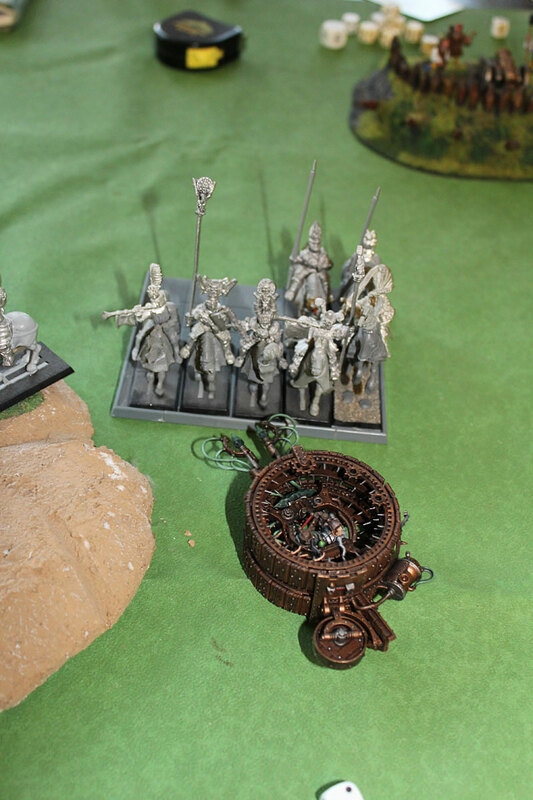 The Knights smashed Doomwheel machine to the pieces, killing the Warlock Engineer and every rats in the engine. One more wheel left… Swordsmen haven’t got that much luck, they killed only one rat, but the rats bit back, killing one of The Empire finest. The combat remain unresolved here. Imperial wizard decided Swordsmen unit will have much use somewhere else and he used Total Power he dragged from Winds of Magic to cast Move Unit spell. 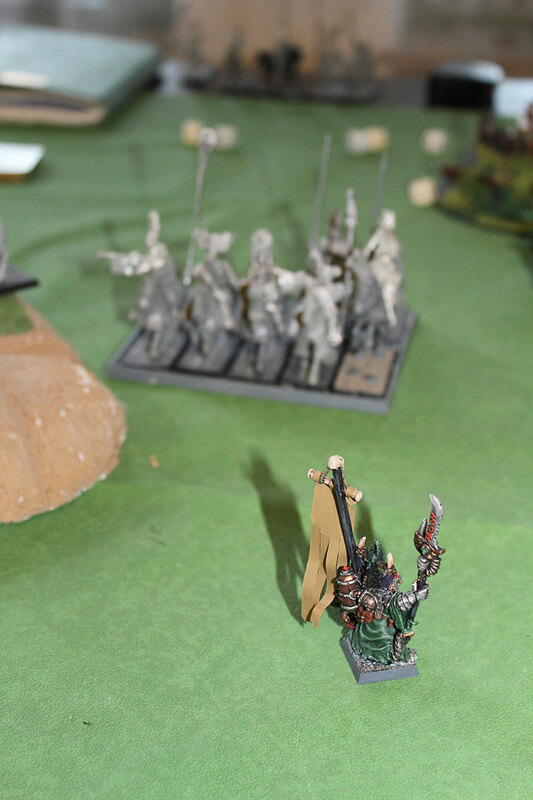 Swordsmen vanished in thin air and all of the sudden reappeared in front of surprised Skaven Slaves. 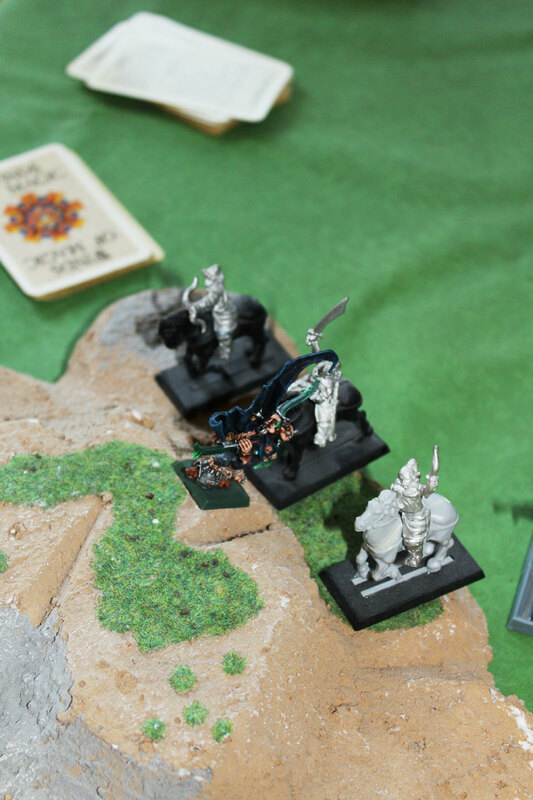 Swordsmen teleported into the close combat with Slaves. Another Wizard casted Destruction, killing 1 of Stormvermin – not very impressive result of very powerful spell. Little bit crazy and suicidal plan born in Ikit Claw’s head… He decided to leave the unit of Clanrats and move forward The Knights of Blazing Sun. He was wearing this day Warpstone Armour and Black Amulet. He was pretty sure – he had protection against Imperial lances. He was afraid of no man, or no no creature. He could stand tied in close combat with The Knights for hours… And if his calculation would be wrong – he had something extra. He was able to pull something special from The Winds of Magic – ability to magical Escape the danger in case something unexpected happened. He forged The Escape in the back of his mind. Clanrats stood in their position, looking their brave leader marching forward. 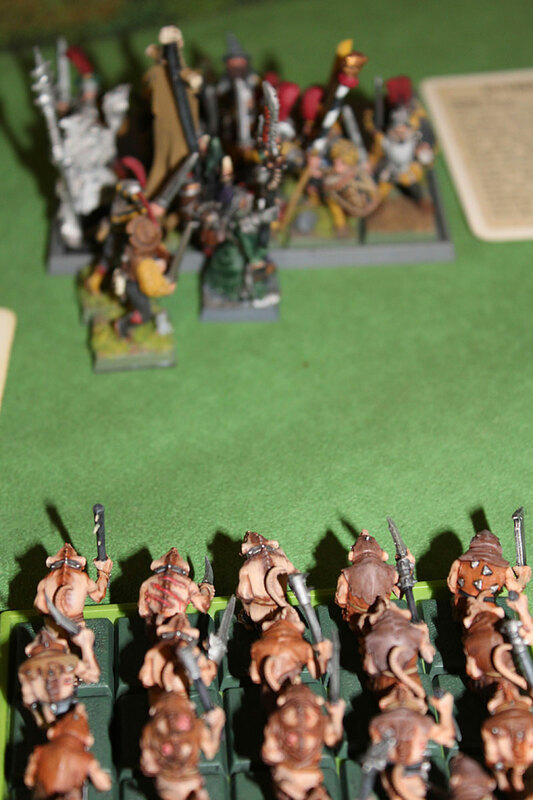 In the same time, Snikch charged the unit of Kislev archers, hoping to cut them out in single moment. 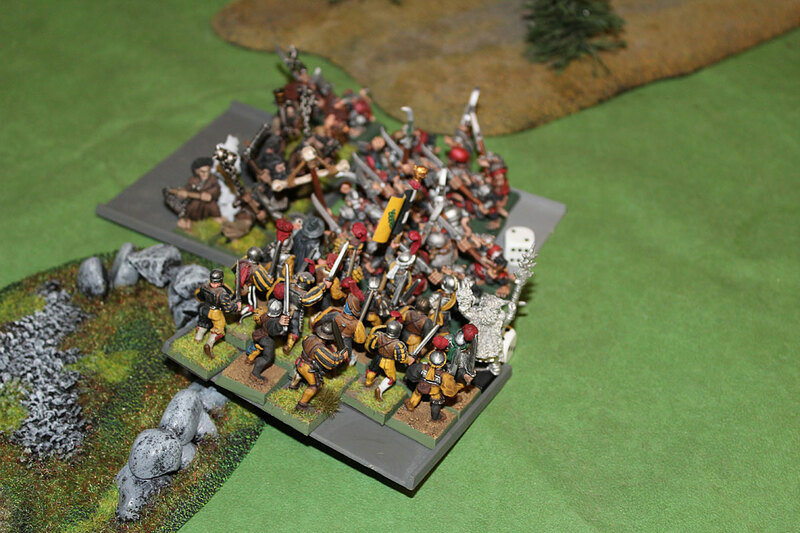 Snikch attack on Kislev Archers. Remaining Doomwheel made an uncontrolled turn to the west and it closed to The Imperial Cannon and remaining crew of misfired Volleygun. Warlock Engineer released the lightings and one of the cannon crewmen fell down burned with the voltage. Jezzails missed The Knights, first Warpfire Thrower’s shot was too weak and the flame didn’t burst far enough to catch even one of The Blazing Suns. 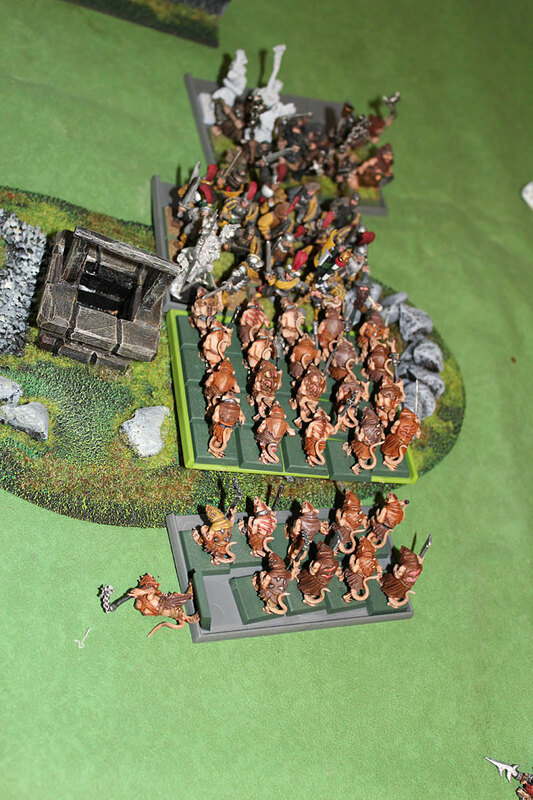 Second Warpfire Thrower (the one attached to the Stormvermin unit on the west part of the battlefield) malfunctioned. The nozzle was blocked and the burning fuel was spilled all over the crew and burned them dead. 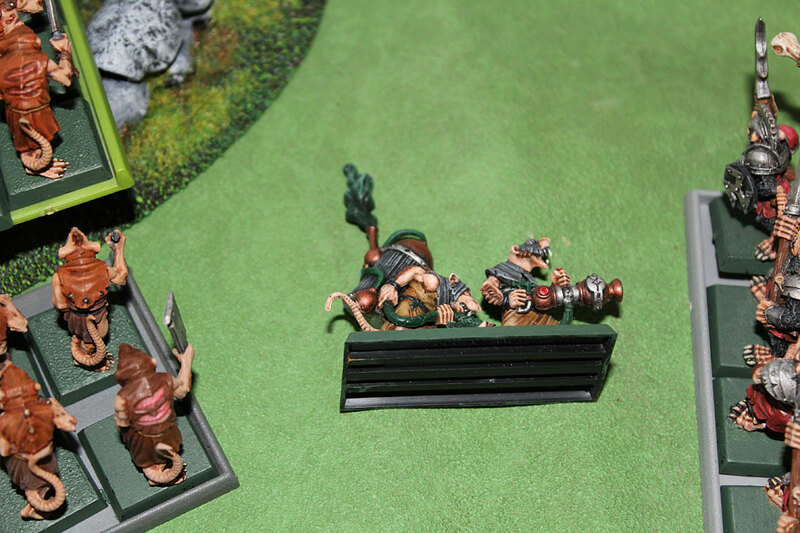 Terrible death, even for Skaven. Eastern Flank – Slaves are fleeing from combat. If before the battle someone will bet that Bohdan Andreyewich will remain alive the one round of combat against Deathmaster Snikch, Chief Assassin of Clan Eshin, he could win the fortune. Unexpected twist of events, or grim laugh of Horned Rat, or maybe blessing of Sigmar, you can call it whatever you want. Bohdan dodged every strike of Snikch’s Weeping Blades. He remained alive! Oh! What a joy! Snikch spit with anger – he did not plan this. He wanted to deal with man-things in a one short moment – instead he was forced to fight with them for such a long time! Unbelievable! (note: Snikch hit 3 attacks and I rolled 2 ones and a two to wound! 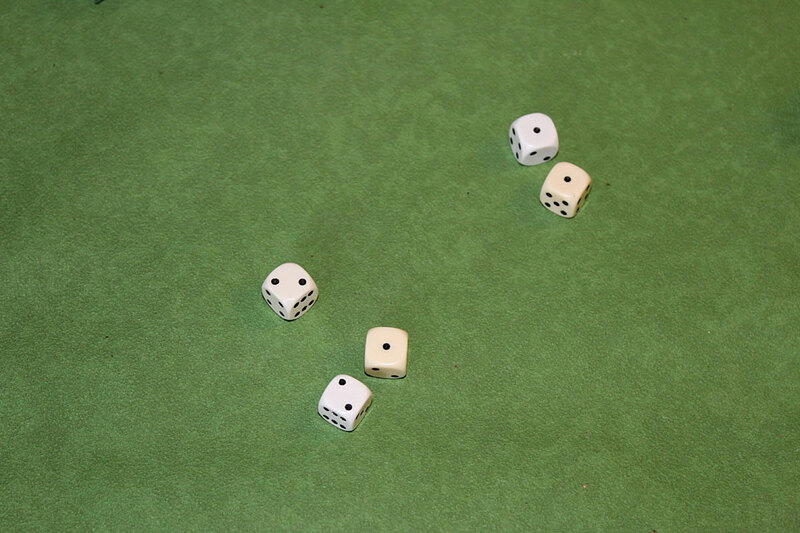 Crazy !…and I totally forgot Snikch was equipped with Warpstone Charm, allowing him to re-roll one failed roll – and add/deduct one to the result! I could have used that!). My rolls for hit and wound. Horned rat is laughing at me! The name of Bohdan Andreyewich has its special place in the annals of Ostland as an example of godly fortune. Meanwhile, Ikit Claw stood against The Count. 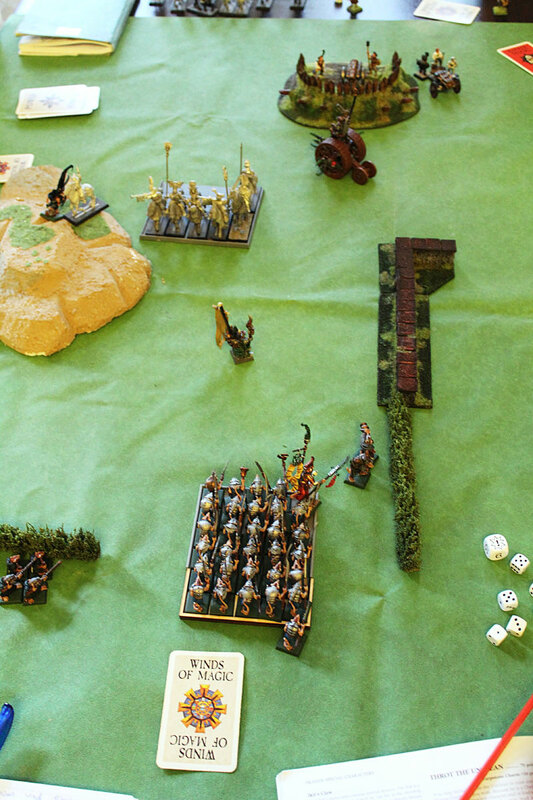 The fight was one sided – and unfortunately for Skaven General, it was not his side was on the winning one. Count von Stashek swung his Flail of Skulls. Magical weapon penetrated Warpstone Armour and Black Amulet failed to rebound the wounds. Ikit was doomed…almost… In very last moment, when he felt it could be his last breath – he said out loud the invocation of Escape and rescued himself from certain death. Count Mathias von Stashek could not believed his eyes. He almost got him! It was so close! Ikit Claw reappeared the battlefield on the eastern side, near fleeing Slaves. The duel weakened Ikit and he was deeply injured. Lucky for him, he got one big flask of Skalm. He put the compound on his almost mortal wounds, and in a moment he was fully healed! The power of warpstone! The great Escape of Ikit Claw. The inspiring presence of Ikit Claw as a general didn’t work for fleeing Slaves. They remained fleeing, but they still was on the battlefield. 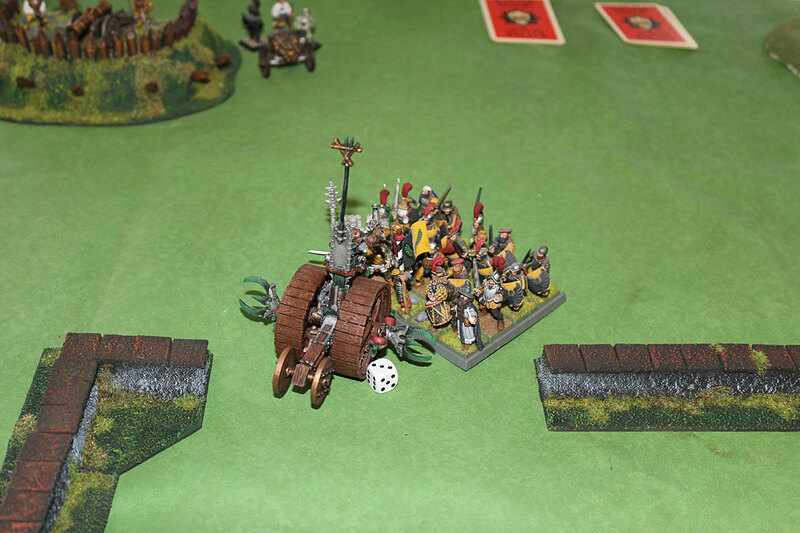 Doomwheel turned in the direction of unit of Imperial Knights, and Clanrats had no other choice than charge them. Another option was to wait for Blazing Suns to charge, and this was certainly not a good idea. Clanrast charged The Empire Knights. Doomwheel is right behind them. Ikit moved near to Swordsmen unit . Doomwheel’s Engineer being so close to the clashed units of Clanrats and Knights, he could only watch the fighting Skaven and men. That, and release the lightings again – they struck into the fight – and by some sort of luck – 2 Knights were killed. Right after that, Warpfire Thrower crew inspired by Doomwheel controller’s luck, tried to fire at swordsmen, but the fuel injector was blocked and the crew stood in flames instantly, dying in horrible way. After long and tiresome fight, Bohdan Andreyewich fell. Snikch squeaked in triumph – his version of the story will ignore incredible amount of luck Kislevite had. The Clan Eshin scribes will write only about his swift assassin and fighter skills. The tactic of Clanrats attacking Knights of The Empire was ok – but only in theory. In practice Skaven warriors were to weak to penetrate the the armour of Blazing Suns. In return Knights hacked and slashed the vermin, killing few of them. That was too much for cowardly minds of Clanrats – they broke the combat and fled. Knights pursued, but even on warhorses, they were slower than Skaven. You know what they say – there is no thing nor no creature faster than Skaven running away, and at least in this case – it was true. 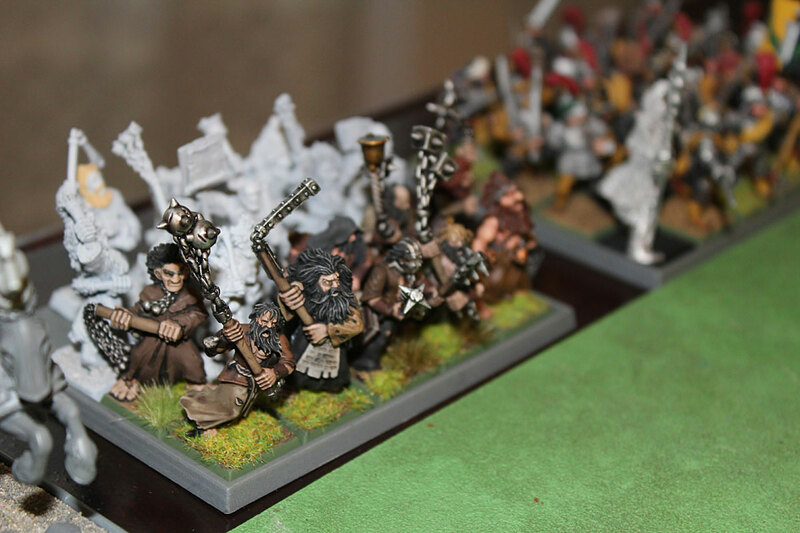 Meanwhile on the east – Stormvermin charged the Flagellants. Ikit Claw was preparing to cast Poison Wind again. He almost drew necessary power form Wind of Magic, but enemy wizard put put in motion phenomenon called Drain Magic. Suddenly Magical Winds had silenced. There was no magical energy in the air, and wizards (and disappointed Ikit Claw as well) could not do anything. The Blazing Sun Order finished their job. They charged fleeing Clanrats and this time was no rescue. Skaven unit was caught and slashed to every last rat! The Knights knew no mercy! They also captured Battle Standard from dead hand of Thrific of Clan Titoosh. Glory to The Empire! – cried Count von Stashek! On the east Swordsmen charged unit of Stormvermin from the flank. That could mean trouble for Skaven. Flanking attack and superiority in numbers – the future for Stormvermin was not that bright. 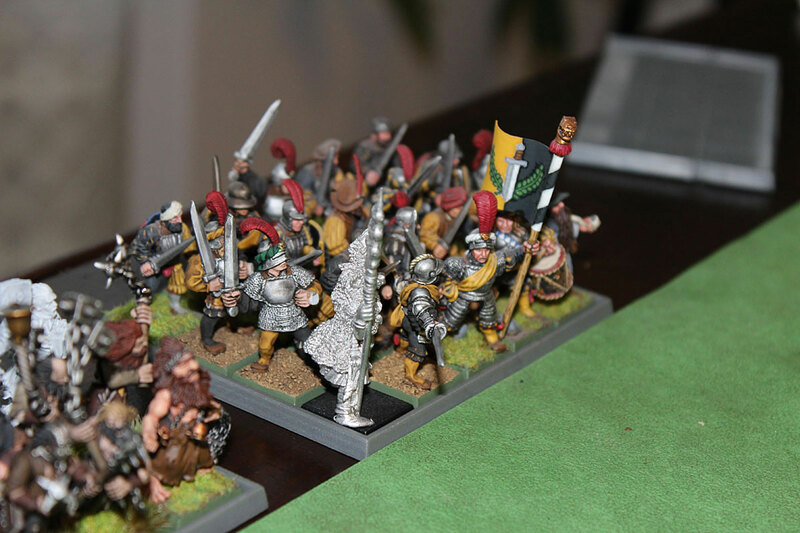 Swordsmen charge from the flank. Cannonball has struck right in front of Ikit Claw. As for Stormvermin vs Swordsmen and Flagellants. It was tight combat. 3 Stormvermin fell. 1 Swordsman and 3 Flagellants on the side of The Empire. Stormvermin lost this one, but remain in place. Even attack from the flank could not break the elite’s spirit! Way to go! Winds of Magic started to form again slowly after Drain Magic, and Imperial Wizards were able to gather power once more. Master Wizard casted Move Unit spell – Ikit tried to dispel that, but he failed. The unit of Swordsmen once again disappeared for a moment – and they emerged to attack Ikit Claw himself. One more move unit- Swordsmen at Ikit Claw himself! Brave man-things! They know no fear of mighty Ikit of Skryre! Skaven Slaves managed to rally. …wow, Jezzails did unimaginable and very rare thing. They ACTUALLY hit, wounded and killed last remaining Knight of The Blazing Sun. Clan Skryre inventions rule! Jezzails killed one Empire Knight. Awesome! Doomwheel at the same time was firing three lightnings, all three hit Count von Stashek, and all three failed to inflict even slight wound to Imperial General. No-no luck…- whispered Doomwheel’s controller. On the east, Ikit stood firmly – he even killed one Swordsmen and The Champion of the Empire unit was killed by rebounded hit from protective power of Black Amulet, which unfortunately got exhausted. The End Times is near! Age of Sigmar is upon us. We are all doomed! Stormvermin are killing rest of Flagellants. The Champion of The Knights, Battle Standard Bearrer and The Count moved more to the east to support Swordsmen, but they were still too far to help them. 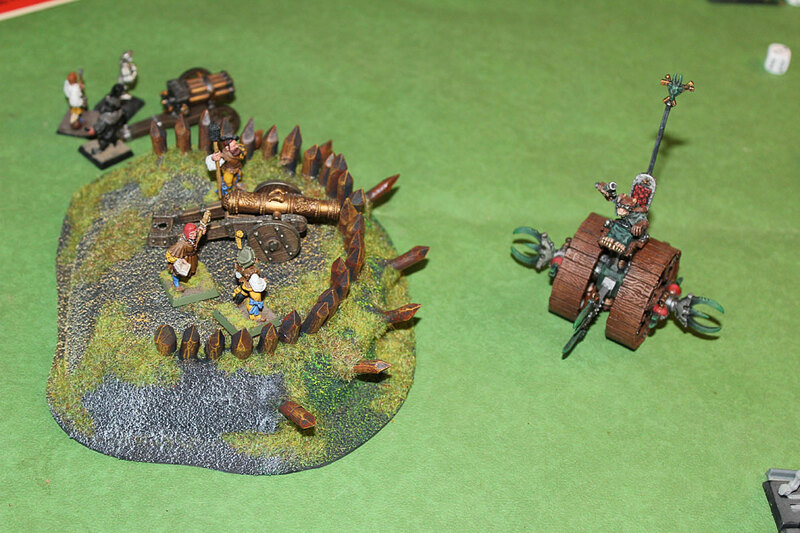 Imperial Cannon misfired, and Crosbowmen shot at Doomwheel, killing few rats from inside the wheel. 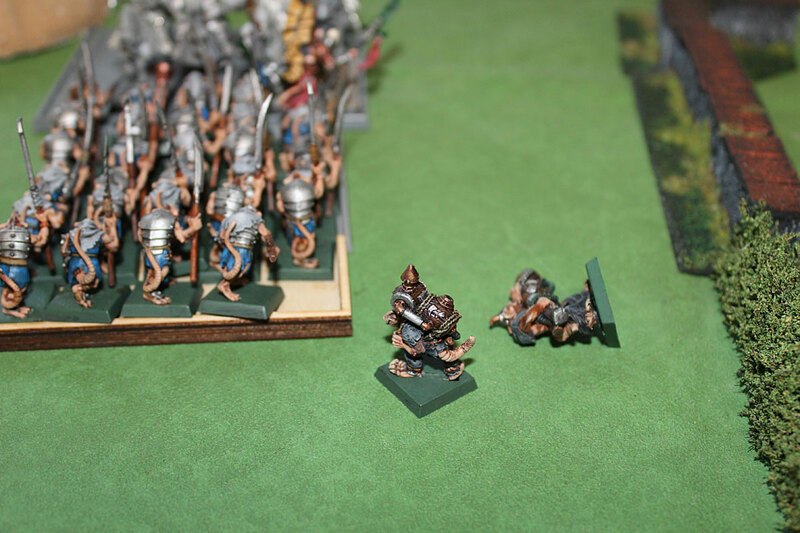 Stormvermin continued to slash remaining Flagellants, but still failed to kill the unit entirely. Stubborn, that’s what they are – they just refuse to die! Ikit did not care about surrounding Swordmen. He saw to much and experienced too many amazing and horrifying things in his life to simply be afraid of death from the hand of puny man-thing. He just laughed and swung his Storm Daemon, chopping the head of one of The Swordsmen. Ikit Claw and Slaves to the rescue! 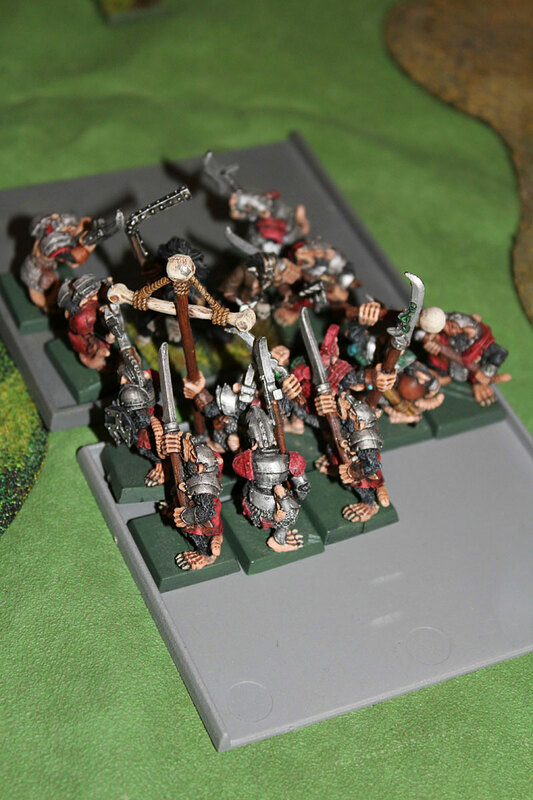 The most defining moment of the battle – charge of the Skaven Slaves into unit of Swordsmen. They attacked somewhat confused Swordsmen. They didn’t expect that these pitiful creatures will attack! 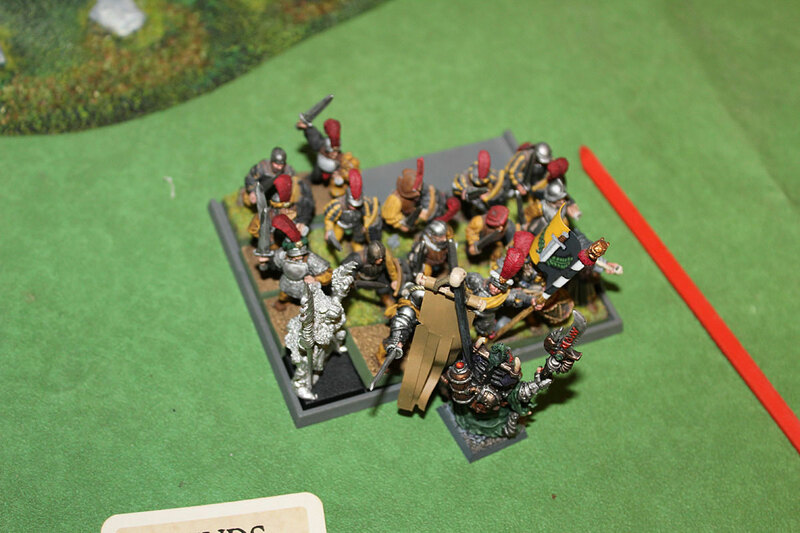 But they did – and they managed to kill 3 of The Swordsmen! And they reply was not even close to be that effective. No Slave died this time. Swordsmen’s confusion transformed into panic and they broke from combat! Slaves and Ikit pursued fleeing enemy and they captured them with no problem. Ikit triumphant! Ikit The Slayer of Man-things! Underestimated Slaves saved the battle! Minor Skaven victory! …and Stormvermin killed the rest of insane Flagellants. When Count Mathias von Stashek sawwhat happened with Swordsmen and Flagellants, he ordered retreat. Remaining Empire forces fell back, leaving the ruins in the hand of Ikit Claw and his rats. Fortunately, Count von Stahek was able to tie Ikit’s forces for long enough to secure evacuation of citizens of Rhoden. At least town was save. …but the warpstone deposit belonged to Ikit! That is it. The story of The Battle of Rhoden. The Day When The Vermin Came. Skaven came and took what they always look for: warpstone. Wow, really, that was super awesome battle. I hope you like the report. For me it was travel back in time – 5th edition – my roots and youth:) I’d like to thank Matheo for this great game and I hope for re-match soon. 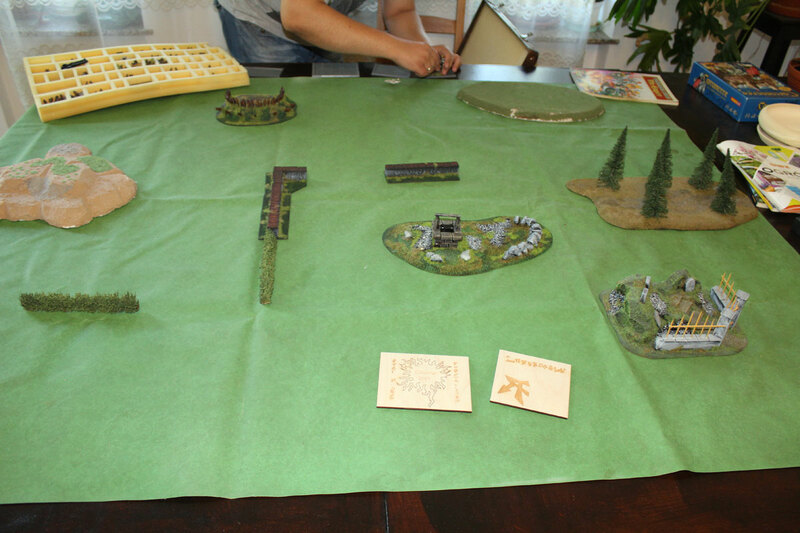 You probably noticed – I didn’t explain any rules for 5th edition of Warhammer Fantasy Battle. I concentrated more on storyline side of the battle than any specific rules. I assumed that people just know them, and that’s it:) After all they are easy to find in some places over the net (but if you have some questions about this battle report – contact me or write a comment below:). Plans for future: I used in this battle two Doomwheels. Generally they are painted but they are not finished in 100%… and I need to finish them finally! First (old metal edition) need to have banner to painted and attached to the pole, and the second one (latest plastic one) is almost finished – some small details to painted and glue to the main wheel). After Doomwheels – Blood Angels! They need to be done at last! I have some 8th edition battles arranged – against orks and wood elves, and I love to give a try to this cursed Ago of Sigmar too! 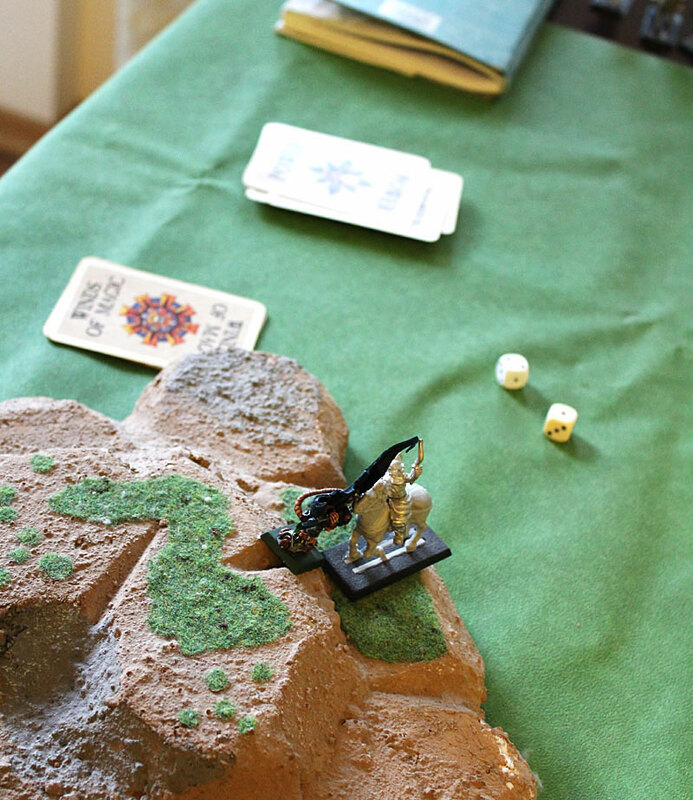 But without any good balancing rules – it’s not a game for me, so we will see about that.